An Introduction to this Series on the years 2009 – 2012 in conflict in Pakistan can be read here. 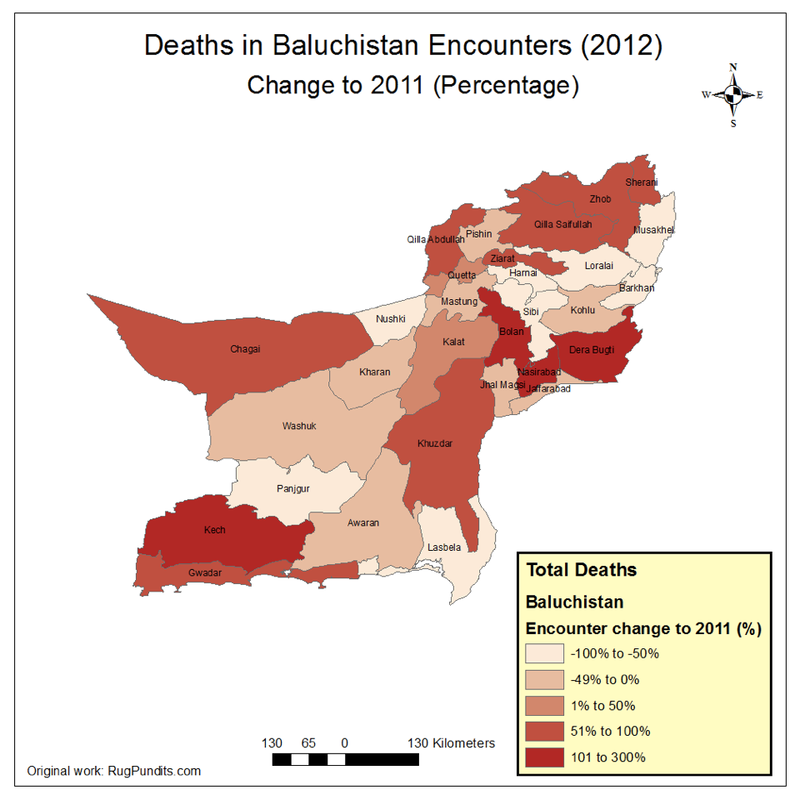 This section deals with data available on Balochistan in detail. 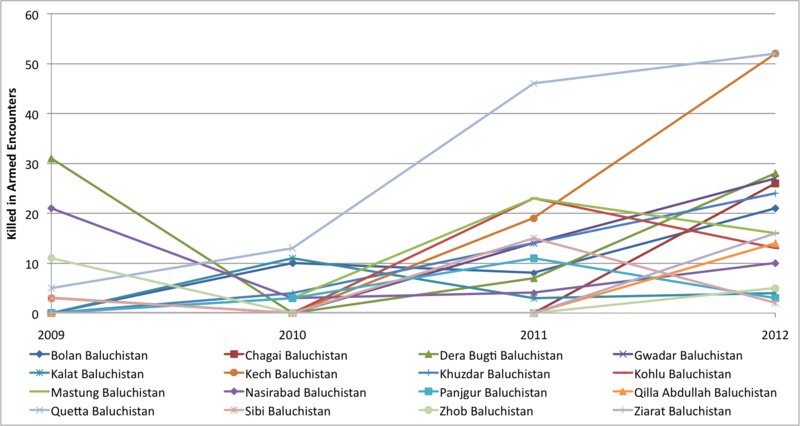 Until reporting on Balochistan hasn’t improved at least on the data side, we are only looking at annual data here, since conclusions from the monthly scale may be even less valid. 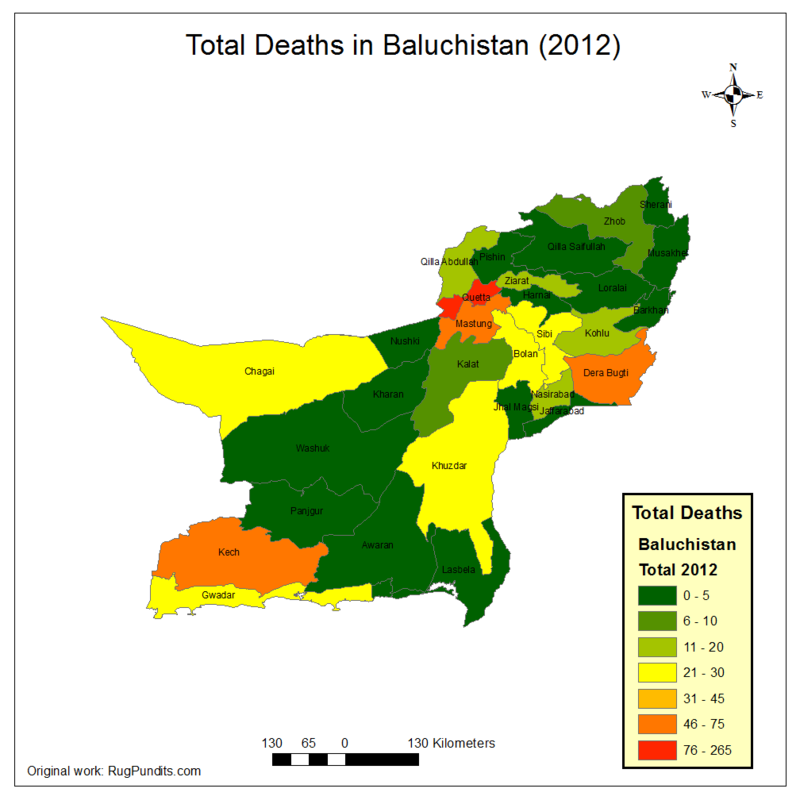 The War in Balochistan is until today getting very little attention. If, it is Quetta, especially since the recent attacks on the area’s Hazara, that surfaces in media reporting and international attention. Equally heavily affected by bomb attacks is the Dera Bugti District and at a smaller scale Nasirabad and Jaffarabad. 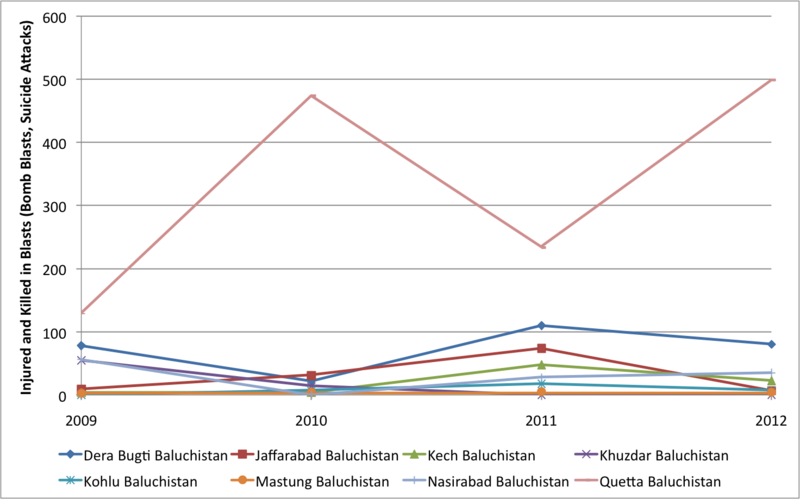 While however in 2012 the number of attacks increased in Quetta, in the other districts blasts decreased (see Figure 1 and Figure 2). This, while in most districts deaths caused by clashes betwen Security Forces and insurgents have risen compared to 2011 (see Figure 3). However the district where blasts happen frequently and those where clashes occur do not overlap – hence any deduction of efficiency of armed interventions is futile, if one sees districts as independent from each other. We have not yet looked at relations between all different districts to be able to make a more detailed statement here. 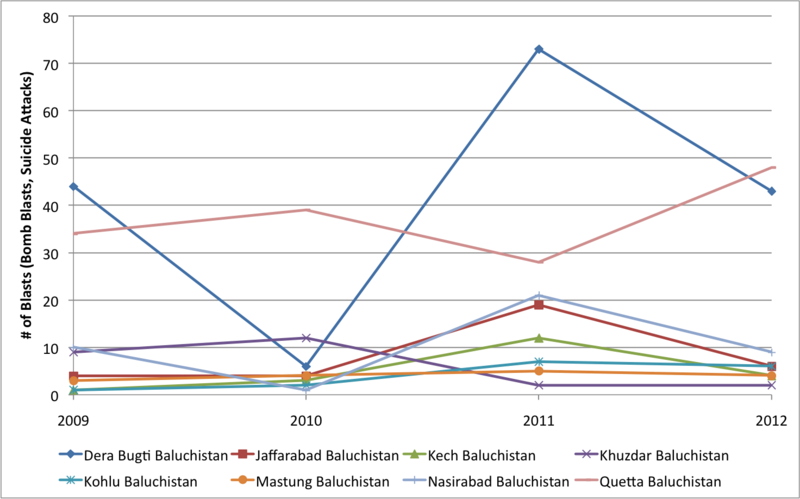 Insurgents killed in armed encounters (Baloch Nationalists) are however often also not linked to the big blasts (often from Sectarian Outfits or Terrorist Outfits originating not historically from the Baloch Insurgency). In the end, it seems like the war’s attention is shifting to Quetta (although this may also solely because attention in the media has risen) and the very Western areas (Kech and Chagai). In these four years, 682 people died in Quetta due to war-like violence (excluding targetted killings! ), which is equivalent to 0.58% of its 1998 population. In Dera Bugti 146 people died (0.12%) and in Mastung 136 (0.12%). 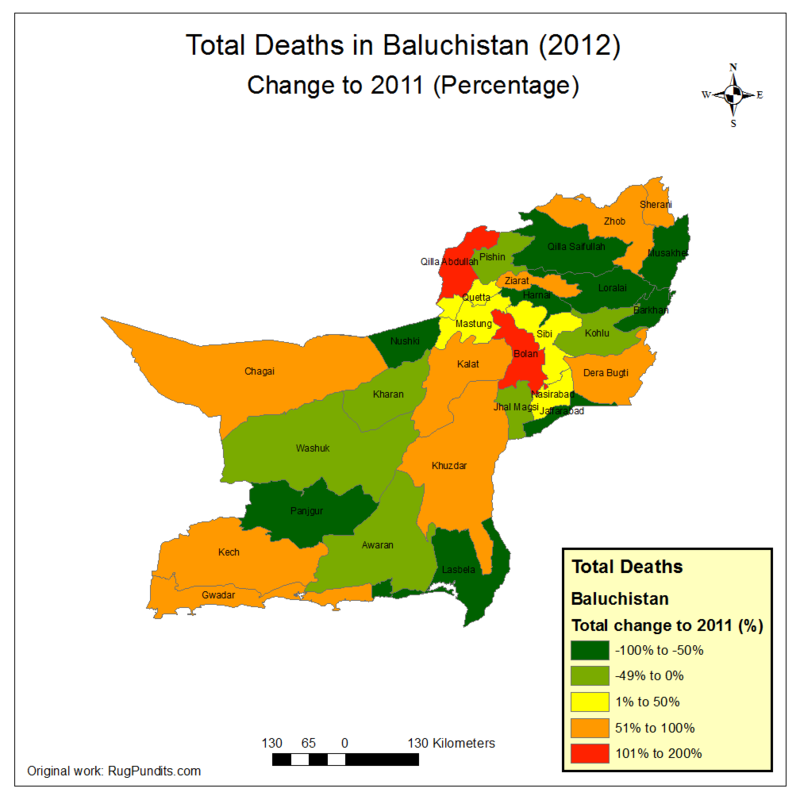 Figure 4 shows a map with all deaths in Baluchistan in 2012, with the respective change compared to 2011 in Figure 5. Clearly there are three areas of unrest. Quetta, as the provincial capital with a lot of sectarian violence, Dera Bugti, the stronghold of Baloch Nationalists and the Baloch Coast, bordering to Iran. However all over the province, violence has risen. From what can deduct from the data, the areas where deaths have been high in general and bomb blasts have occured were also prone to clashes between security forces and insurgents. Apart from the earlier mentioned three regions it is in Khuzdar, Nasirabad and Bolan where clashes were frequent and have even increased significantly from 2011 to 2012. The information on sectarian reasons for attacks is still to patchy to make it a point here. Major attacks (blasts in Quetta, attacks on pilgrims from other provinces going to or coming from Iran and attacks on Punjabi settlers especially in the province’s south) have been recorded in the past but probably many sectarian attacks have then not been attributed as such. In 11 districts did the number of deaths significantly increase in 2012 compared to the 2009-2011 mean, in 5 it decreased (see table below). 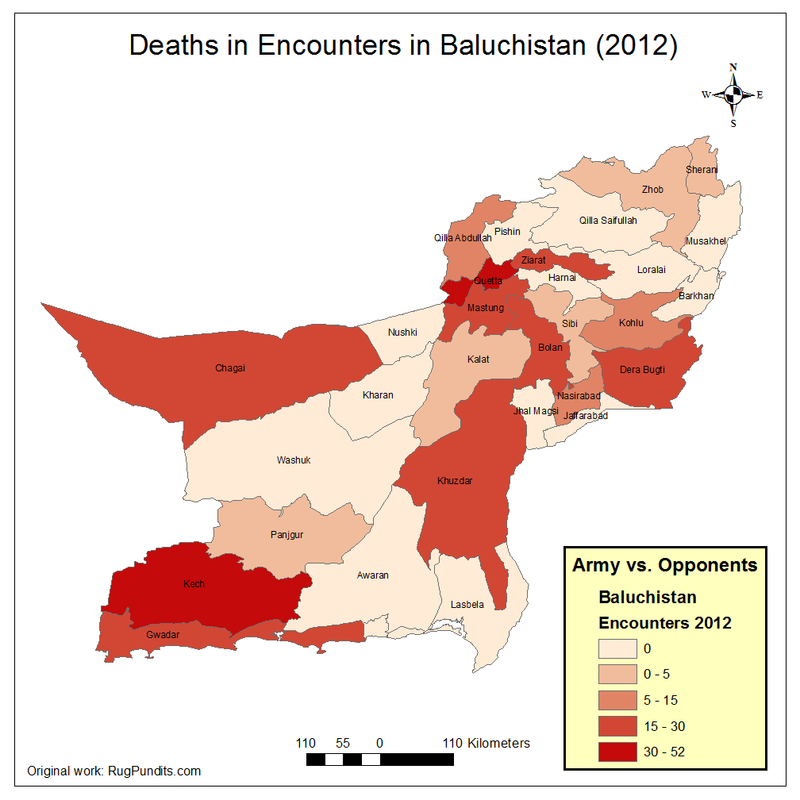 In Chagai, Dera Bugti, Gwadar, Khuzdar, Qilla Abdullah and Quetta also deaths in encounters specfically have increased.